England 2-178 (Alastair Cook 87*, Kevin Pietersen 62*, Pragyan Ojha 2-65) trail India 327 (Cheteshwar Pujara 135, Ravichandran Ashwin 68, Monty Panesar 5-129) by 149 runs. Alastair Cook once again led from the front along with Kevin Pietersen on a spinning track as all six wickets fell during the day belonged to the spinners. India was all out at 327 runs after consuming 115.1 overs and England responded well by smashing 178 runs for the loss of just two wickets in 65 overs. 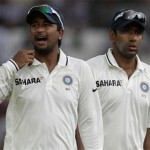 The third day’s play came to an end on Saturday, November 24, 2012, at Wankhede Stadium, Mumbai. Earlier, India commenced the day at 6-266 in 90 overs, the centurion Cheteshwar Pujara was stable at 114 accompanied by Ravichandran Ashwin who occupied his crease for 60 runs. Monty Panesar and James Anderson bowled well and gave away just 10 runs in the first seven overs when Pujara hit the first four of the day in the next over. Ashwin was declared leg before wicket off Panesar on the fourth ball of the 99th over for 68 from 114 deliveries with 9 fours. Harbhajan Singh walked in next and was dropped on one run by Jonathan Trott in the slip off Panesar in the 105th over. He kept creeping with Pujara and hit 11 runs in the 11th over with 1 six and 1 four but was held lbw off Graeme Swann for 21 runs. Cheteshwar Pujara was finally stumped by Matt Prior off Swann for 135 from 350 deliveries with 12 fours. 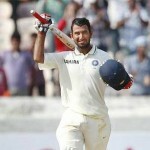 Pujara hammered unbeaten 206 and 41 runs in the first Test at Ahmedabad against England and it was the first time in three innings when he was dismissed by the visitors. The Indian innings came to an end at 327 in 115.1 overs mainly due to a convincing 111 runs seventh wicket partnership between Pujara and Ashwin. Monty Panesar was the most successful bowler with five wickets, Graeme Swann also bowled well and clinched four wickets and James Anderson held one wicket. 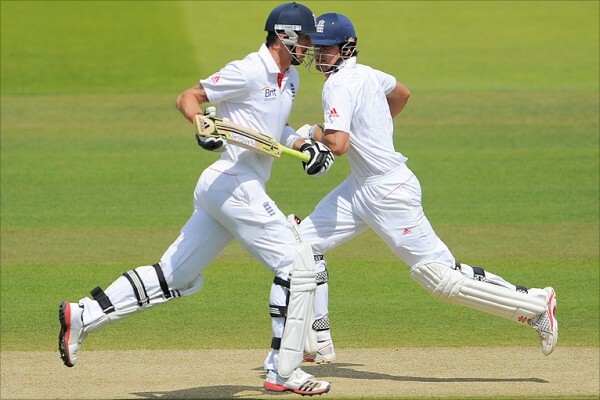 The English skipper, Alastair Cook and Nick Compton started off in a defensive mode and scored 12 runs off the first seven overs with a couple of fours from the first. Compton hit his first boundary in the next over and Cook dispatched the initial six of the innings in the 15th over. They kept on crawling and the first fifty of the innings was attained in the 23rd over. Harbhajan Singh was handed over the ball in the 25th over by the Indian captain, MS Dhoni, and the bowler ended up by giving one runs. Harbhajan was inducted in the Test side after a lapse of almost 16 months as he played his last match against England at Nottingham on July 29, 2011. The openers enhanced the score to 66 in 31.4 overs when Nick Compton was caught in the slip by Virender Sehwag off Pragyan Ojha for 29. Jonathan Trott found him in the declining form again as he was declared leg before wickets off Ojha for a duck after the addition of just two runs in the total. Kevin Pietersen joined in next at a time when England was at the receiving end at 2-68 in 34 overs and he made an impact by hitting a four on the very first ball. He added two back to back fours to Harbhajan in the 37th over and his willow started flourishing boundaries regularly. Alastair Cook accomplished another Test fifty on the fifth delivery of the 43rd over after the score crossed hundred runs mark. He scored more runs with the assistance of boundaries after his fifty as Pietersen smashed his 28th Test half century on the first ball of the 56th over with a four. The pair remained undisturbed and the hundred of the partnership appeared on board in the 61st over. England was chasing nicely and reached 178 runs in 65 overs at stumps on day two. Alastair Cook was 13 runs short of his 22nd Test ton scored on 209 balls with 1 six and 10 fours whereas Kevin Pietersen secured his end with a gusty knock of 62 off 85 comprising 9 fours. England is still 149 runs behind the first innings total of India but keeping in view the present form of the two batsmen in the centre with a lot of batting still to come, they can get a reasonable lead. India will anticipate a couple of quick wickets in the first hour of day three which can bring their dominance back in the game.